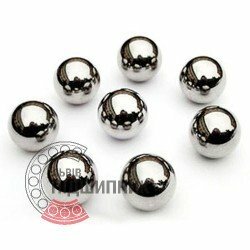 Steel balls for rolling bearings, diameter 3.5 mm (GOST 3722-81). The price is per one piece. Net product price: 0,33 грн. Gross product price: 0,40 грн. Steel balls for rolling bearings, diameter 1.3 mm (GOST 3722-81). The price is per one piece. Steel balls for rolling bearings, diameter 1.0 mm (GOST 3722-81). The price is per one piece. Steel balls for rolling bearings, diameter 10,0 mm (GOST 3722-81). The price is per one piece. Net product price: 1,98 грн. Gross product price: 2,38 грн. Steel balls for rolling bearings, diameter 11.112 mm (GOST 3722-81). Inches designation - 7/16". The price is per one piece. Net product price: 2,64 грн. Gross product price: 3,17 грн. Steel balls for rolling bearings, diameter 11.906 mm (GOST 3722-81). Inches designation - 15/32". The price is per one piece. Net product price: 2,97 грн. Gross product price: 3,56 грн. Steel balls for rolling bearings, diameter 12.0 mm (GOST 3722-81). The price is per one piece. Net product price: 3,30 грн. Gross product price: 3,96 грн. Steel balls for rolling bearings, diameter 12.303 mm (GOST 3722-81). Inches designation - 31/64". The price is per one piece. Steel balls for rolling bearings, diameter 12.7 mm (GOST 3722-81). Diameter in inches - 1/2". The price is per one piece. Net product price: 4,62 грн. Gross product price: 5,54 грн. Steel balls for rolling bearings, diameter 15.0 mm (GOST 3722-81). The price is per one piece. Steel balls for rolling bearings, diameter 15,081 mm (GOST 3722-81). Diameter in inches - 19/32". The price is per one piece.